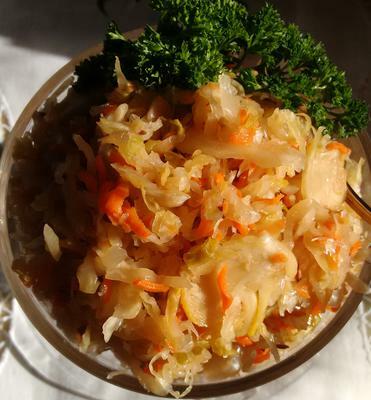 Look up the health benefits of fermented cabbage - you may never want to be without it --- and it tastes great! Layer about 2" of the vegetable mixture in a crock pot, sprinkle 1/4 teaspoons caraway seeds on it, pound down with a wooden dowel; keep layering 2" of the mixture, sprinkling 1/4 teaspoons caraway seeds, pounding down, repeat. You want to extract as much juice as possible, enough to cover the vegetables. If necessary, salt water can be used to make sure the cabbage is fully submerged. Completely cover the vegetables with the clean outer cabbage leaves, and put weights on the leaves. If no weights are available, use an inverted plate on the cabbage, and put a water-filled glass jar on to the place, cover the crock pot with a fine cheesecloth. Let sit at room temperature for 2 days, then put the container in a cool corner for 2 - 4 weeks to ferment. You can start tasting the cabbage after about 10 - 14 days, but make sure to cover everything tightly again. Then, transfer the fermented vegetables into smaller jars, seal with lid and keep in refrigerator. This is for Suzanne, but I don't know if she'll ever read it so it's also for anyone who wonders about making sauerkraut at home. For the first week or two, it does smell. What does it smell like? To me, a swamp or stagnant pond water. People who aren't familiar with that smell usually think it smells like farts. How to deal with this? If you have a closed pantry, or a cupboard that doesn't need to be opened a lot, that can help a bit. I stick mine in a cool storage closet that isn't otherwise being used. In my opinion, homemade sauerkraut tastes so much better than what you'll usually find in a store. It's super easy to make, and very hard to ruin. Best of luck! Thanks so much for all these wonderful recipes! I love LOVE this website. I am not a fan of jarred sauerkraut. I've enjoyed a few from restaurants and am wanting to make some home made, but my spouse is less enthusiastic with the idea of smelling it. Any recommendations for the smell?